Protec security doors and window screens have undergone extensive performance testing. The dynamic impact test is designed to simulate an intruder trying to kick his way through a security door or window. The test is performed with a bag full of lead shot and sand, weighing more than 40 kg. The bag is smashed into the security screen with a force of 100 joules. The test is repeated 5 times. View video. Passed. 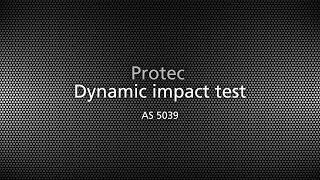 The dynamic impact test doesn’t make much of an impact on a Protec security door or window. A burglar trying to kick his way past a Protec security screen will be wasting his time. The 1.6 mm thick perforated aluminium sheet just won’t give in. The jemmy test is designed to simulate an intruder using a lever to get past the security door or window. The test is performed with a large screwdriver at all locking, hinging and fastening points. The force applied is up to 450 N (45 kg) for 20 seconds – way beyond the capability of most potential intruders. View video. Passed. All Protec security doors passed the test easily – each and every locking and hinging point was secure after the test. 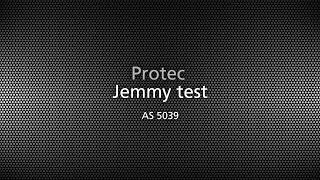 The jemmy test couldn’t be performed on the Protec security window because the dynamic impact test left no gap to insert the screwdriver. Even armed with a large screwdriver, potential intruders won’t get past a Protec security door or window. The knife shear test simulates a knife attack on your security screen. A heavy duty trimming knife is dragged along a 250 mm line with a force of 150 N (15 kg) vertically and up to 350 N (35 kg) horizontally. The test is repeated 3 times – each time with a new blade – along the same line. To pass this Australian Standard test, continuous penetration of less than 150 mm is required. The knife shear test leaves the Protec security doors and windows practically unscathed. Even a strong burglar with a heavy duty trimming knife and 3 fresh blades won’t get past a Protec security door or window. The probe test simulates an intruder having created a gap and trying to get his hand inside to unlock a door or a window. A deflecting force of 1.5 kN (150 kg) is applied to each opposite side of the opening to increase the space enough to get a hand through. Passed. This test simply can’t be performed on a Protec security door or window. The tiny holes in the solid aluminium sheet are far smaller than the test requirement of a 213 mm diameter probe. The perforated aluminium sheet in a Protec security door or window won’t allow an intruder to get his hand inside to unlock a door or a window. Imagine an intruder trying to pull out your security screen…that’s what the pull test is all about. The security door or window must be able to withstand pulling forces of up to 2 kN (200 kg) for 20 seconds at various positions from various angles. Passed. The test is over before it begins. Protec’s mesh is so fine that there is nothing to grab – the test lab has nowhere to pull. And even after the dynamic impact test and the jemmy test, there is no gap between mesh and frame on the Protec security doors and windows. If the test lab can’t find anywhere to pull, what chance does a potential intruder have? You are safe behind a Protec security door or window. Cutting pliers are popular tools among burglars. The shear test simulates a cutting plier attack on a security screen. The shearing tool applies increasing pressure until the sample strand breaks. The force required to break one strand must be at least 3 kN (300 kg). Passed. The test simply can’t be performed on a Protec security door or window because the holes in the perforated aluminium sheet are too small for the pliers to get a hold. A potential intruder armed with cutting pliers will have to leave your house empty-handed. There’s no way the pliers will get a hold.